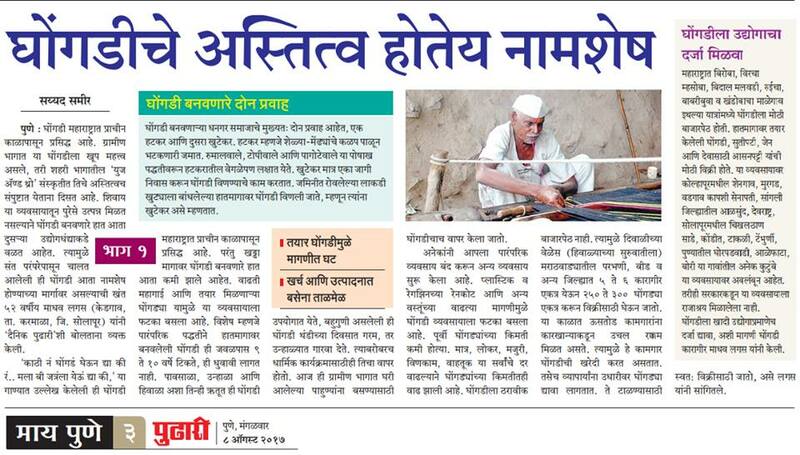 The craft of ghongadis has been languishing in Maharashtra, but a new online social venture in the city may prevent its death. 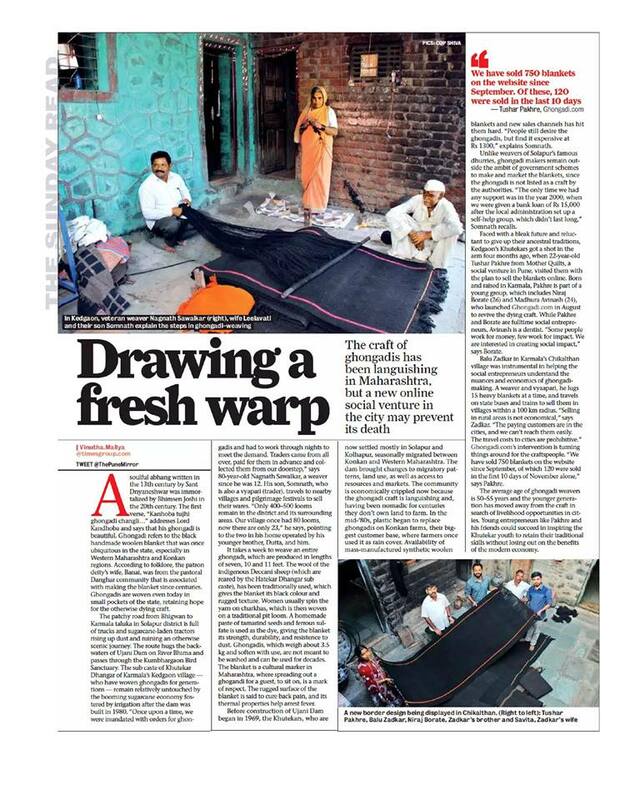 Faced with a bleak future and reluctant to give up their ancestral traditions, Kedgaon’s Khutekars got a shot in the arm four months ago, when 22-year-old Tushar Pakhre from MotherQuilts, a social venture in Pune, visited them with the plan to sell the blankets online. Born and raised in Karmala, Pakhre is part of a young group, which includes Niraj Borate (26) and Madhura Avinash (24), who launched Ghongadi.com in August to revive the dying craft. While Pakhre and Borate are fulltime social entrepreneurs, Avinash is a dentist. “Some people work for money, few work for impact. We are interested in creating social impact,” says Borate. Once considered an indispensable part of a household, the traditional woollen blanket of Maharashtra — the ghongadi — has lost much of its ground over the last few years. 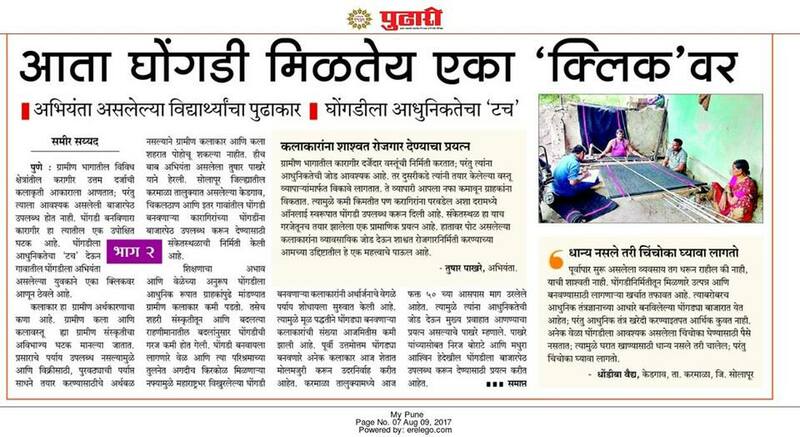 A group of young entrepreneurs from Pune are now planning to revive the market for such blankets through an e-commerce platform — Ghongadi.com. 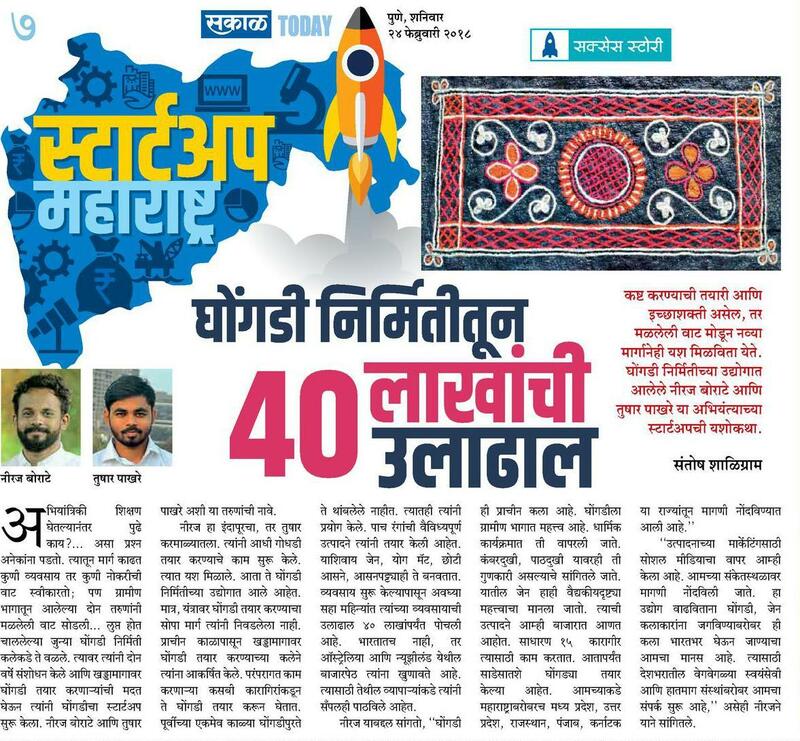 The brainchild of engineers Tushar Pakhare, Niraj Borate and dentist Madhura Avinash, the website offers traditional weavers from rural parts of the state an alternative market. ""उत्पादनाच्या मार्केटिंगसाठी सोशल मीडियाचा वापर आम्ही केला आहे. आमच्या संकेतस्थळावर मागणी नोंदविली जाते. हा उद्योग वाढविताना घोंगडी, जेन कलाकारांना जगविण्याबरोबर ही कला भारतभर घेऊन जाण्याचा आमचा मानस आहे. त्यासाठी देशभरातील वेगवेगळ्या स्वयंसेवी आणि हातमाग संस्थांबरोबर आमचा संपर्क सुरू आहे,'' असेही नीरजने याने सांगितले. घोंगडी विणण्याच्या ग्रामीण कलेला आधुनिकतेची जोड देण्यासाठी करमाळा तालुक्यातील निरज बोराटे आणि तुषार पाखरे हे अभियांत्रिकी शाखेतले पंचविशीतले तरुण मेहनत घेत आहेत. यासाठी त्यांनी चक्क www.ghongadi.com या संकेतस्थळाची निर्मिती केली आहे. व्यवसायानिमित्त पुणे, मुंबई आणि इतर काही शहरात बऱयाच जणांना घोंगडीचे महत्त्व माहीत नाही, हे सर्वेक्षणामुळे लक्षात आले. त्यामुळे ही कला टिकून राहावी आणि या कलेवर जे अवलंबून आहेत याचा त्यांना थेट फायदा व्हावा यासाठी सातारा, सोलापूर, सांगली येथील कलाकारांचा आम्ही शोध घेत आहोत. महाराष्ट्राला प्रत्येक घोंगडी विणणारा कलाकार घोंगडी डॉट कॉमला जोडला जावा तसेच १०० वर्षांनंतरही लोकांना घोंगडी माहीत व्हावी, यासाठी प्रयत्न करण्याचे ध्येय निरज बोराटे आणि तुषार पाखरे जपत आहेत.